Teachers can you hear that? It’s the sweet sound of Thanksgiving break right around the corner. A much needed vacation from report cards, conferences, and lesson planning. As exciting as this time of year is, it also means that December is knocking on our door. I don’t think it’s just me when I say that December brings its very own kind of crazy. That little elf might have something to do with it. But, I’m here to tell you that there is a way to keep teaching writing and harness our students’ holiday excitement all at the same time. How-to writing is always a favorite of mine both to teach and read. It’s a skill that comes more easily to our students when presented with real-life situations and strong mentor text examples. It can also be so much fun to tie into the holidays. Teaching students procedural writing will only benefit them in the long run so when you tie it to turkeys and Santa, it truly is a win-win. Ask your students to turn and talk and share with their partners if they were to catch a turkey, how would they do it. Once you have listened in , share out some responses that you collected from your students. Explain that this book is from the turkey’s perspective and shares how he did not get caught on Thanksgiving. 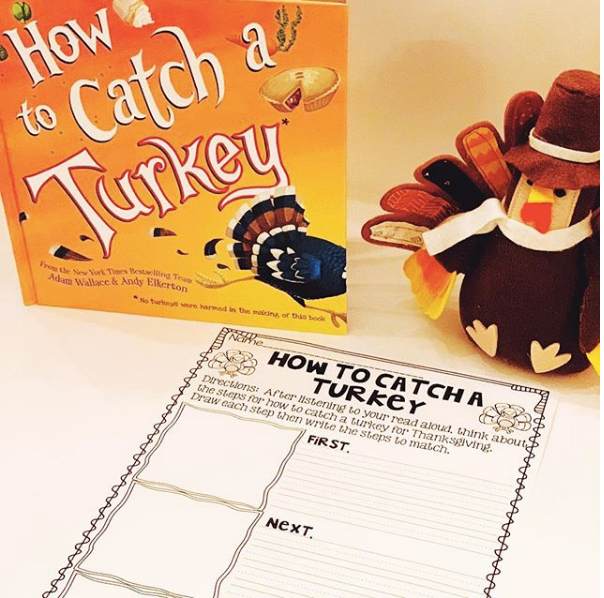 While reading, make sure you point out the bold print the author uses and the different ways the turkey gets away from the people trying to catch him. After you shared your Thanksgiving read aloud with your students, it’s time for them to write. Have them brainstorm ideas for how they would successfully catch this turkey and not have him get away like he did in the book. Their responses are sure to be entertaining! Much like Thanksgiving how-to writing, I want to share a read aloud that I love to use with my students for Hanukkah. The Night Before Hanukkah by Natasha Wing is a great addition to your holiday library. It has simple illustrations and a familiar rhyming scheme that students are already accustomed to. It’s a wonderful story showcasing Jewish family traditions during this holiday. After your read aloud there are several how-to ideas that students could use to write about. At this point, I would encourage any of my students who do celebrate Hanukkah to act out and model some of the traditions to easily show each step. Or, students can reenact things that they saw in the book with their partners to make the steps of their how-to writing more clear and concise. This Christmas how-to writing project has been one of my favorites to date. I combined a popular STEM activity and how-to writing all in one. Now, to keep your students engaged and writing you do not have to do the STEM activity but it was highly effective to have students make something first and then immediately write about it afterwards. 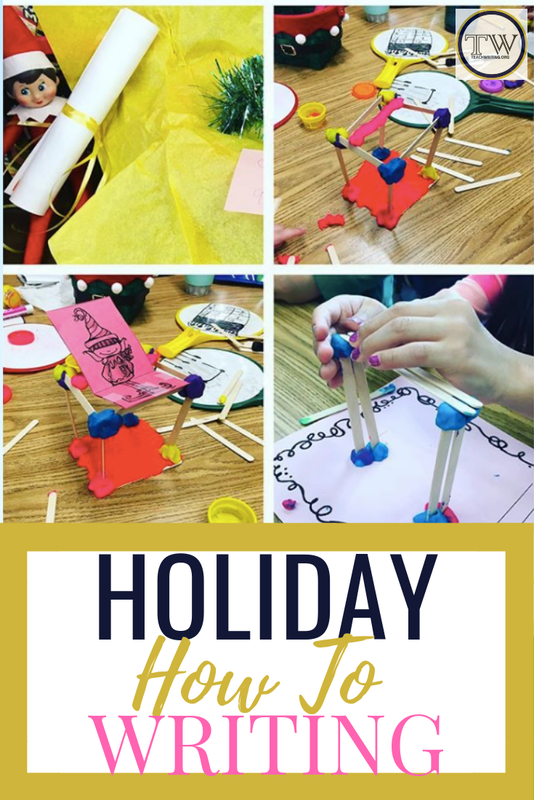 I used a resource from Teachers Pay Teachers author Brooke Brown called Christmas STEM Challenges found here and added my own twist to it. I created a letter from Santa Claus asking my students to build a shelf for our class elf that was high enough to see the entire class but sturdy enough that she could sit on it comfortably. My students were given this task, broken up into groups and sent with materials to complete their project. First, my students had to complete their shelf for our elf using the resources provided. Then, once it was completed they had to write a how-to piece for Santa so that he could recreate it in his workshop at the North Pole. Since Santa had to recreate it himself, the students were encouraged to use precise language and make sure their steps were easy to follow and very clear. Having the model shelves with them helped so much. Needless to say, this was highly engaging and talked about for weeks afterwards! Some action shots of our elf delivering our letter from Santa and students working on completing their shelves. I hope these ideas will keep your students motivated and engaged during the holidays! Looking for more resources to help during the holidays? Check out my Thanksgiving Reading Response Sheets to go with any Thanksgiving read aloud! How-To writing sheets are included! Hi there! My name is Jayme and I am the creator of Teach Talk Inspire. I have a passion for teaching little learners to read and write and am determined to show every student that they’re already writers! I taught first grade for 7 years and acted as a lead teacher for Teacher’s College Reading and Writing Project. I loved to collaborate with other teachers to develop the most effective practices to teach writing to elementary aged students. I have a Bachelor’s Degree in Journalism from Penn State University and a Master’s in Elementary Education from Duquesne University. My love of writing has been there from the very beginning! When I’m not blogging or creating resources to help teachers in their classrooms, I’m playing and reading with my one year old daughter; my number one student at the moment!